Last time we looked at the career of “the Last Emperor” Fedor Emelianenko. An interesting run to say the least, marked by some truly spectacular victories. The Russian surely hopes to recreate his past glory when he faces Frank Mir this Saturday at Bellator 198. This is a curious fight. The historical significance has thankfully not been lost in the build-up, despite a dulled edge to it’s importance. With both fighters past their primes, we aren’t necessarily getting the UFC vs Pride heavyweight showdown we always wanted. However, the novelty of seeing the former champs opposite one another inside a cage doesn’t completely fail to stimulate the heart of a fight fan. Whilst Fedor was dominating over in Pride, Mir was leaving a trail of limbs behind him in the United States. The submission specialist was never the most consistent heavyweight in the world – and thanks to a near fatal motorbike accident that cost him the heavyweight belt in 2005, we may never really have seen the most of Mir for an extended period. Nevertheless, he was amongst the best heavyweights in the world for around a decade representing the UFC, while Fedor was considered the number 1 over in Pride. Emelianenko fought the best Pride had to offer, producing incredible clashes the stand the test of time. But, did he fight the best? I think that’s hard to say. Discussion as to who had the best roster, Pride or the UFC, was heated. The general consensus throughout the 2000s was that the Japanese organisation at least featured the best big men under it’s banner. What with Fedor, Cro Cop, Minotauro, Mark Hunt, Semmy Schilt, Alex Emelianenko, Sergei Kharitonov and Josh Barnett. With Fedor being the best, he must have run through that murderer’s row. Didn’t he? Well, not really. Emelianenko would score an admittedly impressive second unanimous decision win over Minotauro, defending his belt and winning the 2004 Pride Heavyweight Grand Prix. He wouldn’t defend his belt again for almost a year, making a pit stop to fight Tsuyoshi Kohsaka in April of 2005. His second defense saw a legendary battle take place in Saitama, Japan, as he took on the feared striker Mirko Filipovic. 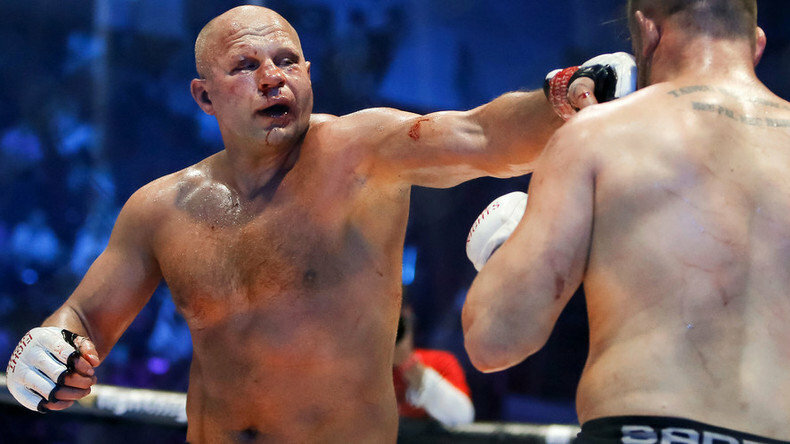 A huge fight, and perhaps Fedor’s most touted victory. Definitely impressive at the time. Fedor’s third and final title defence came in December of 2006 – his final Pride fight. Between the two championship fights, he logged two victories against an admittedly past his prime Mark Coleman, and Zuluzinho. That final belt defence would be against Mark Hunt, who had just lost to Josh Barnett, and was the second loss in what would amount to a six-fight losing streak for the “Super Samoan”. The problem with the “undefeated for 10 years” stat is it sounds great, but most people recite it without really considering the substance of the streak. Fedor was fed a number of people who didn’t really deserve to be in the ring with him. He would, of course, beat these individuals, adding to his legend and star power in Japan, a place at the time known for its passionate fans. It has to be said that, while Pride was a wacky, fun promotion to watch, they didn’t shy away from underhanded business tactics. Fighters have even come out saying that many fights were fixed. I’m not saying that’s what happened with Fedor, but it’s certainly interesting to consider why he only defended his title three times. Is it outside the realm of possibility that perhaps Fedor was fed obviously lesser fighters – perhaps even bought out fighters – to add to his star power. We’ll never know if this really was the case, but it has to be noted. And what of his big wins? Cro Cop and Nogueira were really the only two who could have been counted amongst the best heavyweights of the time. Fedor did prove his dominance against these men, and that can’t be taken away from him. But, when both men journeyed to the UFC, they were exposed to a degree. Maybe that’s unfair to say of Minotauro, but it certainly applies to Cro Cop. In fact, one could point to a litany of Pride crossovers who all of a sudden started losing when stepping into the octagon. Wanderlei Silva, Akihiro Gono, Takanori Gomi and Heath Herring all posted losing records when transitioning to the UFC. Even fighters who were decently successful in the promotion, like Shogun Rua and Dan Henderson, were nowhere near as prosperous as they were in Pride. It brings to mind a rant of one Chael P. Sonnen. While tongue in cheek – this is the “American Gangster” we’re talking about – he raises some interesting points. Does this not call into question the merits of these fighter’s Pride runs? How good were they? Why couldn’t they replicate after leaving Pride? Did Fedor see this failed pilgrimage and abandon any desire to go to the now MMA world leader? Tragically we will have to go without answers. Emelianenko is 10-4 since leaving Pride. Three of those losses – interestingly – took place in Strikeforce, and one in Bellator. It can’t be understated how much of a tragedy it is that Fedor never fought in the UFC. It leaves a plethora of questions about the true nature of the Russian’s legacy. Perhaps it was the right decision for him personally, as his trips to the States have yielded far more bitter fruit than elsewhere. I’m not trying to say that Fedor isn’t a great fighter. He is; the skills are visibly present, but he finds himself in a similar position to Demetrious Johnson. Questions will persist as to the true level of his competition, and unlike DJ, Fedor’s competition has been exposed to a certain degree. I only ask that you don’t immediately recite Fedor’s stats when having the GOAT conversation. It’s not so black and white. Maybe I’m completely off base. Maybe “the Last Emperor” can reassert his position atop his throne. He needs to, as Stipe Miocic storms the castle gates. At forty-one years of age, Fedor takes on one of his contemporaries in a dream fight. Can Fedor piece things together in Bellator after a devastating loss to Matt Mitrione? We’ll find out Saturday, April 28th.